The back of this Bespaq chair has been painted with acrylic or oil paints over a cotton surface. Some pencil lines are visible. 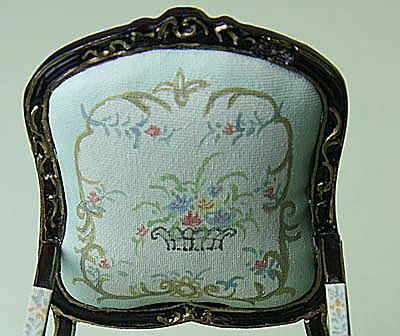 The simple carving on the back of the chair is painted with gold paint to bring out details. Photo copyright 2010 Lesley Shepherd, Licensed to About.com Inc.
Bespaq furniture is available in sets and single pieces, mainly in mahogany or walnut finishes, with some pieces also available in a painted finish and occasionally as unfinished pieces. The furniture is available in Australia, North America and Europe from a number of suppliers, in scales of 1:48, 1:24, 1:12 and some 1:6 pieces, with the greatest range in 1:12 or standard dolls house scale. Manufactured by the same Asian factories that make other dolls house miniature furniture, including Jiayi, the Bespaq line shares some of the construction and finish features of other Asian furniture brands, but has a wider range of styles. Created by Pit Ginsberg, Bespaq began as a higher end range of manufactured dolls house furniture and continues to feature elaborate classic and regional furniture styles with some reproductions of famous pieces. Bespaq is sold in various named ranges, with 'Platinum' editions sold by Aztec under the 'Town Square' label, and Bespaq 'Basic' sold as a simpler form of the main featured line. Often listed as "Museum Quality", Bespaq is quality factory made furniture which tends towards more elaborate furniture styles. Detail is good, with drawers and doors fitting and functioning smoothly and well scaled. The "stains" used are fairly thick, possibly polyurethane coatings, which occasionally obscure some detail and do not allow wood grain to show through. "Mahogany" and "Walnut" refer to the finish and not the underlying wood, which is unknown. Like other manufactured dolls house furniture from Asian factories, the mahogany stain is very red, and the walnut is warmer than the normal finish associated with the name. The finishes do match well with similar furniture ranges, many of which may be made in the same factory. Bespaq colors do change slightly, so it is best to buy sets at the same time, in case the finish changes. Occasionally unfinished pieces of Bespaq are available, allowing you to apply a finish more in scale to the piece. Construction is fairly basic, without the attention to construction detail and joins of true artisan or museum quality furniture in these scales. Painted upholstery and furniture lack the precise crisp detail of true artisan finishes. Although they are well done for factory pieces they understandably tend to lean towards an Asian aesthetic in their carving and painted details. Bespaq tends to feature documented traditional designs with carvings or details which can be very strong. In general, the lines of the furniture are good, but slightly heavier than you would find in artisan work, although a similar weight to other manufactured sets. Asian manufactured miniature furniture suffers a bit from 'scale creep' where pieces are slightly oversized. A good effort has been made to use carved details to disguise the thicker sections whenever possible while keeping the piece strong and able to support the size and weight of heavily dressed dolls. The size of the wood used makes the furniture fairly sturdy. Upholstery fabrics used for cushions and chair backs for wood chairs are fairly simple and generally in scale. Some more elaborate pieces have painted fabric surfaces, which are not particularly appealing viewed up close. Reproduction printed period fabrics would be more suitable and more realistic. Upholstered chairs come in a number of fabrics, well in scale to the furniture style. Checks and stripes are well matched and lined up on the various pieces which use them. An annual catalogue outlines the various suites, pieces, finishes and fabrics available. Prices for Bepaq furniture range from around $40 for an individual chair, to several hundred dollars for a living or dining room suite. This is a good range of manufactured miniature furniture designed to fit into several historic periods and room settings, although it tends to be overly elaborate, and must be balanced carefully in the overall design. Purchasers should be aware that the prices can be close to that of true artisan pieces with better construction, woods, and finishes. Bespaq should be chosen for particular design styles. Similar styled pieces show few little differences from brand to brand in higher end Asian manufactured dolls house miniatures.